Anesthesia personnel have come to rely heavily upon end-tidal carbon dioxide concentration to confirm correct endotracheal tube placement and adequate ventilation. We report a case of sudden loss of end-tidal carbon dioxide during a prone-positioned case due to a substantial leak in the breathing circuit caused by failure of the sidestream capnography measurement system. This failure was a result of a crack in the water trap for the gas analyzer on a Dräger Apollo anesthesia machine that occurred from accidental spillage of isoflurane. Extra water traps readily accessible in the storage drawer of the anesthetic machine. Finally, we appreciate the response and cooperation of the manufacturer in reducing the likelihood of this problem affecting the safety of any other patients. Dräger welcomes the opportunity to respond to this letter. 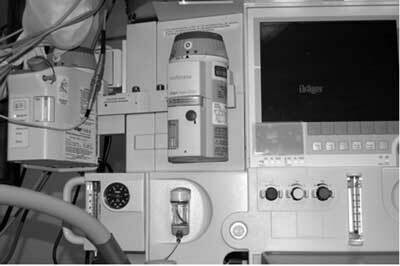 Dräger became aware of this potential failure mode after the release of the Apollo anesthesia machine in 2006. This failure mode requires that liquid anesthetic agent fall onto the water trap, and is not considered normal operation of the machine or vaporizer. In order to minimize the risk of this reoccurring, internal documentation was developed and released to the sales and clinical applications teams for installation training to advise the customers not to place the isoflurane vaporizer above the water trap. The author reports a substantial leak as a result of the water trap cracking. Dräger has not been able to reproduce this finding, and suspects that this may not have been related to the cracking of the water trap. The water trap is connected to the breathing system by the sample line. A standard sample line has an internal diameter of 1-2 mm, and a length of 4-6 feet. The maximum flow of gas at normal ventilation pressures is no more than 200-300 mL/min. In addition to the revised training documentation, Dräger has subsequently replaced the key filling system on the vaporizers, with the new DrägerFill system which has significantly reduced the risk of spillage of anesthetic agent during the filling process. For customers that are concerned about the potential for leakage of liquid isoflurane during vaporizer filling, Dräger has developed a field upgrade kit for existing Vapor 2000 vaporizers to the new DrägerFill design. Please contact your Dräger representative for more details. McAllister RK, Payne MN, Bittenbinder TM. 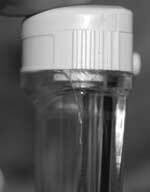 Disruption of water trap from leak of isoflurane during the vaporizer filling process in the Dräger Apollo. Anesthesiology 2007;107:514.
http://www.ispub.com/ ostia/index.php?xmlFilePath=journals/ija/vol2n4/pmo.xml. Reaccessed December 2, 2008. Dear SIRS refers to the Safety Information Response System. 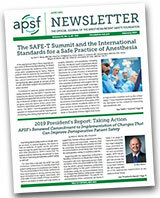 The purpose of this column is to allow expeditious communication of technology-related safety concerns raised by our readers, with input and responses from manufacturers and industry representatives. This process was developed by Drs. Michael Olympio, Chair of the Committee on Technology, and Robert Morell, Editor of this newsletter. Dr. Olympio is overseeing the column and coordinating the readers’ inquiries and the responses from industry. Dear SIRS made its debut in the Spring 2004 issue. The information in this column is provided for safety-related educational purposes only, and does not constitute medical or legal advice. Individual or group responses are only commentary, provided for purposes of education or discussion, and are neither statements of advice nor the opinions of APSF. It is not the intention of APSF to provide specific medical or legal advice or to endorse any specific views or recommendations in response to the inquiries posted. In no event shall APSF be responsible or liable, directly or indirectly, for any damage or loss caused or alleged to be caused by or in connection with the reliance on any such information.